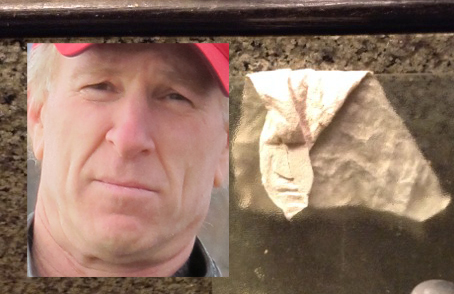 A re-useable bamboo paper towel with the owner’s face accidentally imprinted on it. Dictionary.com defines Pareidolia as the imagined perception of a pattern or meaning where it does not actually exist, as in considering the moon to have human features. Here we see a remarkable resemblance between the owner of the bamboo paper towel and the towel itself. 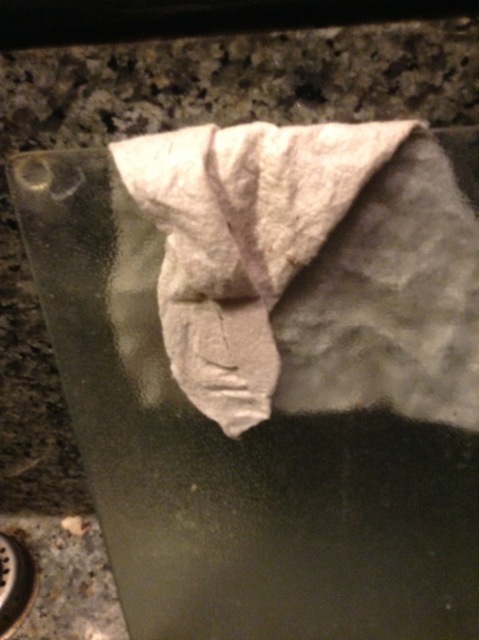 The man noticed the face the day after he had used the towel and put it up to dry. A cutting board had been laid against the wet towel and flattened it. The man received the roll of reusable bamboo towels as a gift from his ecologically aware daughter. I would have been more freaked out about this phenomena if the towel looked like one of my recently deceased friends. What do you think, dear reader, pareidolia or??? Fahrusha is a well known NYC area intuitive and can be reached at fahrusha@fahrusha.com. She is available for events as well as private consultations. Man looks like his paper towel!